I know that to some people this film and all the ones before and after will be marked as untouchable. Put there to shine as great examples of films from their beloved book series. I’m sorry to say I am not one of those people. Sometimes a judgement of a film can be tarnished by a bad viewing experience. 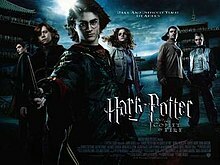 My Nan had just read the book Goblet of Fire so I decided to rent the disk and take it to her. My Nan, Grandad and I watched through the whole film. The whole 157 minutes of it.. In fact.. If you have a minute. They used to sell VHS tapes with 3 hours recording time. This film was approaching that time. It didn’t feel as well put together as Azkaban. (That film was only ten minutes shorter but it did feel significantly shorter). I wanted to quite like it. The setup of a tournament had me intrigued to start with but it just fell to the length problems of say the last Lord Of the Rings film. There were points when I just wanted the Dragon thing to eat him and have done with it. My Nan hadn’t wanted to say so, but she had felt the same way. We had all sat through it and not one of us could really follow it. I get it quoted that I wouldn’t understand because I hadn’t read the books. My response is .. I shouldn’t have had to. Plus my Nan had and she was unable to follow it. So for this viewing.. The film had totally failed.